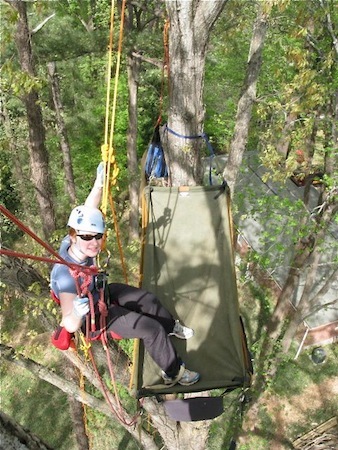 Modules include lanyard and load-lift systems, skills and techniques for advanced line setting (including the use of the "Big Shot" and the "Yella Grapnel"), branch walking, and split-tail climbing. You'll also learn how to install a Treeboat hammock and set up a traverse, as Rosie has done (picture at left). When you finish this class, you'll want to spend more time moving up, down and around in the canopy, and maybe even camp out in the treetops for a night or two. Our website's Galleries have lots of pictures of climbers and TCI classes and events. Location: Taught at the TCI Clubhouse. Gear: We prefer to train you in your own saddle if you own one. If not, we have gear on-site for students' use. Prerequisite: BTCC; or on-site demonstrated proficiency with the DRT climbing system prior presented in our "Tree Climbing Basics" DVD. TCI reserves the right to discharge students from our class (without refund) if they come to class unable to perform basic tree climbing skills. Young Climbers: Only children over the age of 13 who are graduates of a basic tree climbing course will be accepted into this course. Adolescents 13 to 16 years old must take the course with a parent or guardian; ages 17-18 must be accompanied by a parent, who does not need to be taking the course him/herself. See scheduling and housing information in our "Logistics" section.